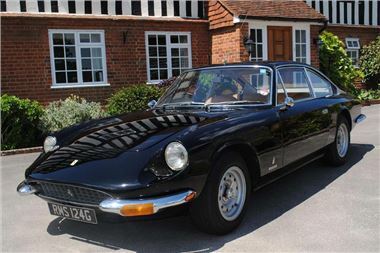 A 1969 Ferrari 365GT 2+2 once owned by legendary Lord, Charles Brocket, is to be auctioned at the Historics at Brooklands Summer sale on July 19th. Part of his 42-strong collection of Ferraris and Maseratis, many of which were tragically destroyed in an insurance scam for which he did time, Brocket owned the ground-breaking Pininfarina styled GT for 15 years. It was the first 2+2 to feature power steering, hydro-pneumatic self-levelling rear suspension and the luxury of air-con as standard. It is expected to fetch offers in the region of £62,000 - £72,000 at auction. Of the 800 365GT 2+2’s built, this elegant Italian tourer is one of just 52 right hand drive examples, and represents sound investment potential, particularly when its predecessor, the 330GT, continues to command prices in excess of £100,000 for the best examples. Supplied new by Maranello Concessionaires in London to a customer in Glasgow in February 1969, Lord Charles Brocket acquired the car in 1979 and subsequently treated it to an extensive restoration, carried out by specialists Jim Bosito, Alfetta Racing, Terry Hoyle and Mike Presgrave of Moto-trim. Invoices on file record in excess of £36,000 spent on a bare metal repaint in black in November 1986, an engine rebuild in February 1989, a re-trim in tan Connolly hide with new black carpets in April 1989, and a suspension rebuild in August 1990. In the 16 years since it was part of the Lord Charles Brocket Collection, the car has covered less than 5,000 miles, and with excellent documentation to match its appearance, its consignment to the Historics sale on July 19th represents a rare opportunity to acquire a low mileage, right hand drive example of this handsome grand tourer.